The dropship doesn't pick up if player is in the pickup location before the beacon appears. Also, particles generated by equipment stay after you get picked up. If you somehow do too much damage to the Terratron in the first stage, he will go through an exploding animation and you'll be stuck on that stage (very rare, the stage normally ends before this can happen; only managed to do this once on normal mode). In the image, you can see the terratron has moved to the top right corner and i'm stuck on the first stage platform. In the second stage, if your party wipes out and the machine in the center is destroyed fast enough afterwards, your party will die in on the Hyperion (you'll still revive, but the camera can be glitchy if you die in the bridge or something) Same goes for if you die right after completing a stage, so you can't get onto the dropship, and attacking particles will also stay for a brief time. The controls for repairing the machine in the center can be a bit confusing; it only really works when you autocast. Using the shortcut key (N) on the target or right clicking on the target doesn't work. The terratron often blows the crap out of the thor drop with his nuke if you do damage fast enough (common on normal mode). 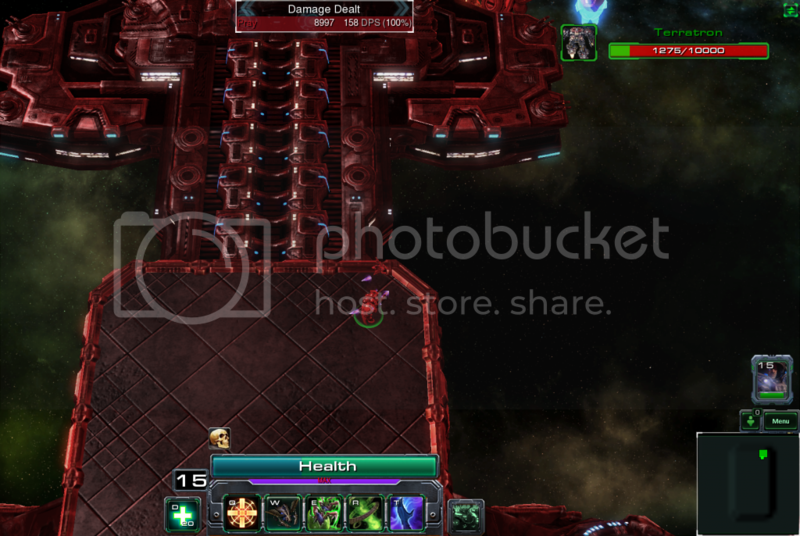 The shockwave upgrade works on both the thor and battlecruiser that come in the second stage; it might be a bit overpowered, since they are massive units (it also works on boss of zombie invasion). On extreme difficulty setting during the bombing run in second stage of the raid engine will get damaged right away and it will get damaged again a second later. Making it impossible to repair efficiently. Plz reduce the damage terratron bombing run does to engine and/or increase the repair rate of engine. It's impossible to complete terratron on extreme as it is. Tried solo tried with a full team as well as three players. Noobtastic wrote: On extreme difficulty setting during the bombing run in second stage of the raid engine will get damaged right away and it will get damaged again a second later. Making it impossible to repair efficiently. Plz reduce the damage terratron bombing run does to engine and/or increase the repair rate of engine. It's impossible to complete terratron on extreme as it is. Tried solo tried with a full team as well as three players. Yeah, I can actually do it solo if I get lucky, but it's really luck; I basically have to kill it before it does something with huge damage to the engine. Since the HP scales 100% with party number, it's probably more difficult in a party because unless everyone is DPSing, it'll take longer to take down his hp, and give him more chances to do something with high damage. Also, on last stage (after the second dropship travel) all of Terratron's attacks kept missing even if me and my allies were straight in the line of fire. This happened to me on extreme difficulty, but i'm fairly certain it happens on every difficulty setting.